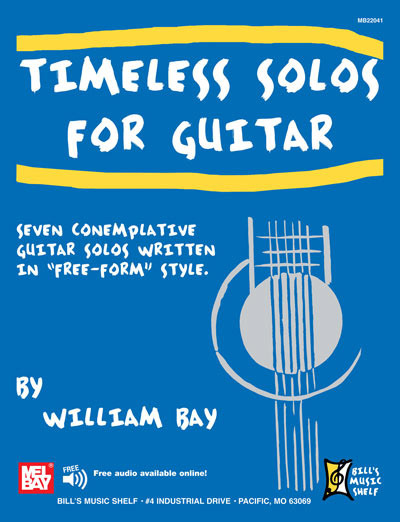 Timeless Solos is a play on words. The solos in this volume contain no time signatures or bar lines. I did this because I wanted the solos to be very expressive in interpretation yet "free-form" in structure. The companion recording presents my interpretation of these works. You may interpret them differently and that is fine! 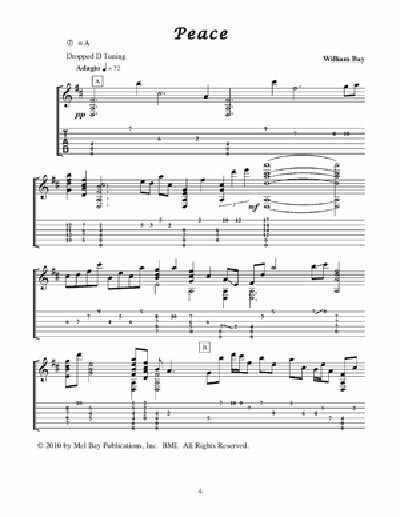 All solos are in notation and tablature. When writing these solos I first envisioned the form as an extended "cadenza". However, from my earlier trumpet playing days I recalled that, especially in the 19th century, a cadenza was a momentary break in a solo which gave the performer a chance to dazzle the audience with his or her virtuosity. These solos are not about that. Rather, they are a vehicle to give the guitarist an opportunity to move the listener with the performer's expressive ability. I also thought of these solos in the form of a "chant". However, most chants are monophonic in form and these solos in various parts present a fairly lush harmonic structure. While the solos were written for a 7 string guitar, they may be played successfully on a 6 string guitar. Alternate notes for those found on the 7th string are shown in the tablature part. Also, the solo, Peace, is written in Dropped D tuning and makes little use of the 7th string pedal tones. The solos are contemplative in nature and provide ample opportunity for individual expression and interpretation. I hope you enjoy playing and performing these works.